It was inescapable really, a brand spanking new Apple product comes out and everyone gets so excited they fall for the inevitable Facebook scam that promises you can get your hands on the tiny iPad for absolutely free! This particular scam looks reasonably genuine and is ‘aimed’ at Facebook developers, who more than likely know better than to click on the link that takes you to a falsely Apple-branded app. Of course, although it’s not known what the scam actually does at this point, it’s likely to be either a survey scam or one that collects personal details, spreads spam or points users to malicious websites with embedded malware. As it happens, Apple has already sold out of the little devils, so if you put in an order now for one (through official retailers), there’s a good chance that you’ll have to wait a couple of weeks. The Free iPad mini offer is on. 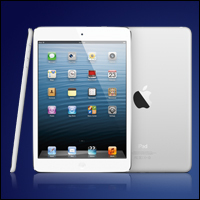 Go here – [LINK] to get Free iPad mini. This then takes you to the rogue app and once you have clicked ‘accept’ the links miraculously appear on all of your friend’s newsfeed. It’s not the first scam of its kind, many promise technological products if you like an app. If you do find yourself caught out, then uninstall the app and ensure that you revoke all of its publishing rights, then give your computer a thorough scan with your AV software and perhaps download malwarebytes, (a free version is available if you scroll to the end of the page) to make extra sure. For details of scams such as these, it’s a good idea to like pages such as Hoax-Slayer and Naked Security on Facebook who publish details of scams as soon as they appear, very often. You have to feel for Facebook workers who were handed shares 5 months ago, only to watch them plummet dramatically in the interim period before they can sell them off. However, now they can, the question is will they want to and should they wait for a recovery in value? Hurricane Sandy hasn’t really helped (although for the guys on the East Coast, shares will more than likely be the last thing on their mind), only really because it extended the period in which employees couldn’t sell their shares due to the closure of Wall Street. However, it seems that it’s not all bad news for the social network’s staff; those who were given restricted stock units, rather than stock options possibly hold shares that are worth something. Those who were working for Facebook before November 2010 could also find themselves with shares that are worth quite a lot of dollar. Personally, I would hold onto them and keep an eye on developments, who knows what’s in the pipeline, what with Facebook rumoured to be attempting to become the new Craigslist and the concentration on mobile – give it a year and some of them could be sitting on their retirement. Hot on the heels of the updated brand pages, professional social network LinkedIn is to get a new look over the next few months, which is designed for users to be able to “tell their professional story” more effectively. “We’re excited to share that we’ve just launched the next generation LinkedIn Profile, making it easier for our 175 million members to tell their professional stories, be found for opportunities, and build relationships through meaningful interactions,” LinkedIn said on their official blog. New features will include a new “visual design”, which makes it easier and allows users to show off skills and accomplishments, such as milestones in their career, or a high-profile project that they’ve worked on. New tools such as the inline editor make this achievable so that it’s easier to update your profile. Another new feature is the visual aspect which shows you what you have in common with your connections or indeed, that sales lead that you’ve been chasing for months. These insights make it easier to find people outside of your network with whom you have things in common. Recent activity will also show at the top of profiles, so that you can quickly and easily view what your connections are up to. To get the new look profile, and be one of the first, you can sign up here; if you’re not sure, then why not take a look at the demo video which recorded the live stream during the LinkedIn press release. Our friends across the pond have had a tough time this week, especially those living on the East Coast as Hurricane Sandy and high tides tore down trees, ripped apart houses and sadly claimed at least 55 lives. Whilst we are in no way mocking the events suffered in the USA this week, this video goes to prove that even in the worst situations, the human spirit is still capable of humour and endurance. Our hearts go out to all those affected by the devastation of Sandy and we hope that America recovers well and quickly. Looking to boost your online viability? Hire us for web video production.